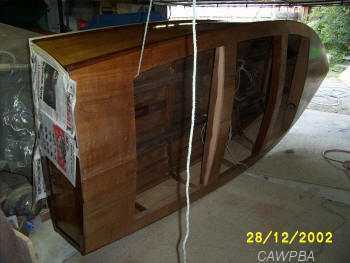 A boat was given to Ross Foster's uncle. 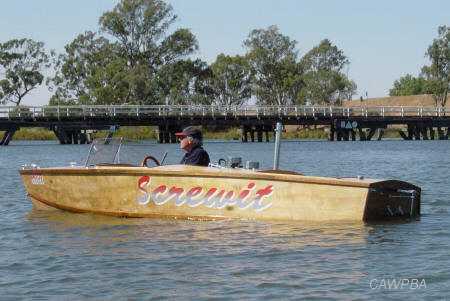 It was not in very good shape and he was told it had some thing to do with Albert Park Lake. 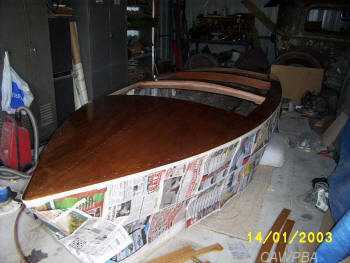 Ted, Ross's uncle, decided to strip it completely and copy every part and rebuild the hull as it was . Ross guesses it was built in the mid to late 50’s and was set up with a Holden grey motor. Most of the fittings, like the fin and rudder, were made only of steel. The engine conversion was early Seacraft with twin carburettors, a water cooled manifold and mounted in an angle iron frame. 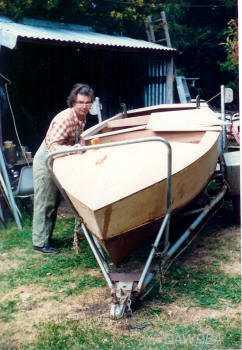 The hull, except for the engine cover, was all but completed in Ted’s spare time in his shed at home. Then it sat there for 15 or 16 years with out any paint on it at all except for under the motor. The motor was just sitting there and the new hull was on the old trailer under some plastic and old floor coverings. The hull had a dust film all over it that had gone mouldy with the damp of the open shed. This had to be removed and then the sanding began inside and out. The engine cover was made with the ply that come with the hull to finish it. All the floors and inside panels had to be made from old patterns and the edges around seating and dash board manufactured. The hull was then sprayed with 2 pack and fitted out. 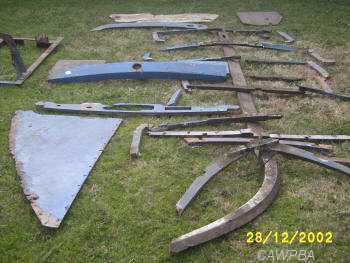 A new fin and skeg and prop shaft were fitted and Ross made a new rudder from the old prop shaft and cavitation plate. The windscreen frames were found at a car swap meet by chance and were re-chromed and fitted as were the rest of the old deck fittings. The trailer was a water pipe construction and not restorable so a new trailer was made at home to suit. Completion took about eight months. After some testing, Ross found the motor had to be moved back 90mm to lift the nose out of the water. The boat was registered in April 2003.